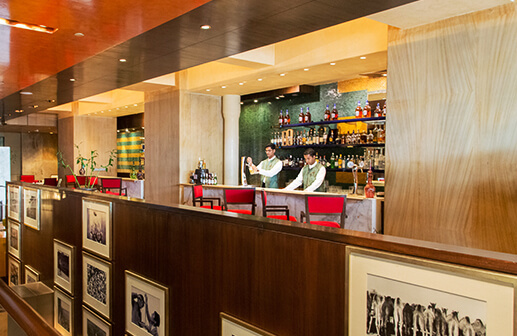 Named after Mumbai’s more colourful and secret history, Opium Den, the bar at Trident, Nariman Point is a wonderful setting for an afternoon cocktail, an early evening drink or a nightcap with friends or colleagues. Enjoy your favourite drink at the Opium Den. Select from our range of fine wines and aperitifs or let our bartenders create something unique to suit your mood. Accompany your drink with an India Jones grand appetizer or main course sharing platter. Enjoy a satisfying Korean set lunch, tangy Asian salads, authentic yakitori, oriental soups, dim sum, noodles, something spicy from our wok range, something piping hot from the Indian clay oven, or choose your own catch from our sea tank and have it cooked just the way you like it. 12.30 p.m. to 1.30 a.m.
From strawberry to green apple, let our bartenders at Opium Den mix some fresh, flavoured mojitos to help you unwind after a hectic day in the city. Round off an eventful day in Mumbai with your favourite drink at the Opium Den. Select from our range of fine wines and aperitifs or let our bartenders create something unique to suit your mood. Indulge in an evening with classic cocktails mixed by our bartenders, along with mouth-watering small bites.